Above & Beyond’s news to open the festival by bringing home a special and rare yoga set promised an exclusive experience in addition to the line-up, that resembled the celebration of another one ABGT event, just bit earlier. A couple of years ago I attended the named trio’s ABGT festival in Amsterdam as the gala of music itself, and this time I had the feeling that the same tradition, atmosphere and emotions would be revived again. It was a hot sunny day in London. Festival attenders were sitting on the comfy and “safe” ground ready for new experience with Above & Beyond. The first sounds from stage and yoga journey was about to start. At the moment I didn’t know what to expect other than new trance festival’s sensations, a yoga exercises session with member of trance trio playing for us, but it turned to be so much more. Of course, it was a blessing to see Above & Beyond members playing on the stage for our yoga experience, but the words and voice of a master, the meanings of sentences and its deepness was a surprise. Even if I’m not a big fan of yoga, the start of festival, when you find your own meaning and purpose in words, accompanied by exercises and meditative, ambient sounds, turned to some healing session. We could release something we brought into the festival, inside ourselves. That was magic, meaningful. Amazing. We were in that unique moment, which we shared all together, especially holding each other hands for the session closing. Above & Beyond festival begun, and after one hour it was a big burning friendly party, where it felt like not standing between strangers, but friendly and simple Anjunafamily. Someone was always there to ask you something and have a conversation with, as a part of enjoying this unique daytime festival. The set of Spencer Brown with simply beautiful melodies made to forget all sleepless night and there was no connection anymore with outside world. It was already worth all the trip made to arrive here, the moment to be in the park for this festival, to listen to progressive melodies and to get lost in that megastructure of steel. This kind of enjoyment can be compared to almost nothing. Very strict, pure, friendly party? Maybe, but very big and active one from the first beats, first hours after yoga session. Grum… Who can forget his singles, sets from ABGT events? The Steel Yard was exploding in lights, fires and jumping fans around in a big satisfaction. The megastructure was almost full for his set: blue sharp lights drove us to an experience that would need time to find a comparison. There was a wish not just dance and enjoy, but to take, to record all the experience deep inside and to lock it there, including the actual feeling, emotions, sound, view, thoughts, the level of amazement of the moment… Pure joy to be there, in trio’s home, London, and to attend this Creamfields event. Then, the start of legendary trio performance… The stage had become blue with slow, beautiful, Above & Beyond sounds on the way, the lights changed and there was that moment. The moment, when all the sea of trio fans are singing around with hands in the air. Slowly built melody and beat, turning to the one entire experience, and you can be jealous for yourself to be there, in that moment under London skies. Festival visitors were singing every word of legendary Above & Beyond tracks like an immense choir. I must say again – the tracks of this trance trio never expire. Literally, their music doesn’t get old. Group plays some of their most popular iconic tracks during every performance, and the crowds around the world turn crazy. Their melodies are just unrepeatable, unforgettable, so legendary and recognizable still by those electronic music fans that enjoy other styles. Remixing, changing the beat of track make those melodies worth to die for. It brings some exclusive euphoria, no matter how many times you’ve heard one or another of Above & Beyond’ tracks before. When the lasers were blinking along with beat, the sea of fans was recording videos or clapping hands, no one stood still. 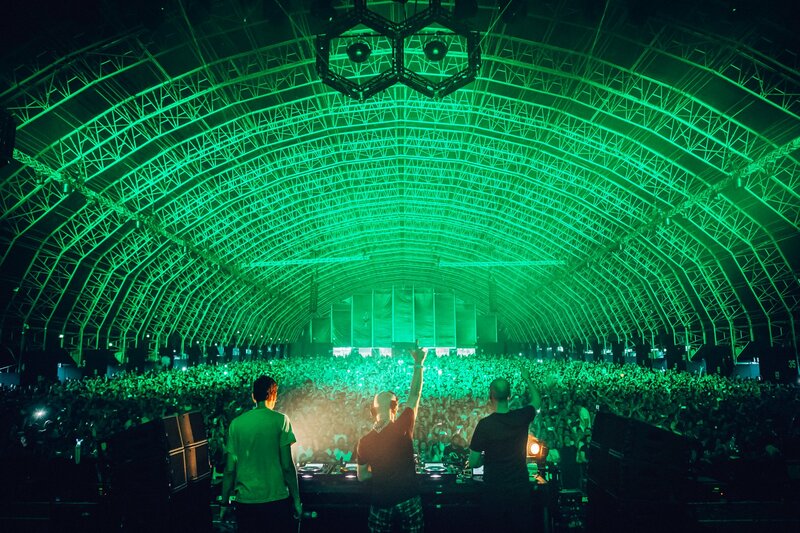 Steel Yard was covered under green bright immense lasers, it covered everything – we were lost in a magic planet and screaming of enjoyment, amazement, euphoria. Those green lasers extended over everything we could feel and see, we lost ourselves, our names and identities, forgot flights back home after several hours and all the world behind the walls of Steel Yard, physical presence. The screams of crowd were so loud and ecstatic – it was louder than the music from the stage… I don’t know if I have ever seen such lasers, anywhere. It crossed our bodies, senses, structure of Steel Yard in darkness. It was more than could be described by any words. The sea of Above & Beyond fans didn’t stop burning during any track. It seemed everyone was jumping by the rhythm of the next person and so all the crowd got into one dancing style. There was no time even for the smallest break, trio played one famous single after another, they burned us by track “Northern soul” from newest album along with the flames from stage and red crossing lights. Above & Beyond ended the set by classical closing track “Thing called love”. But no one left. This festival’s experience was more than unique. 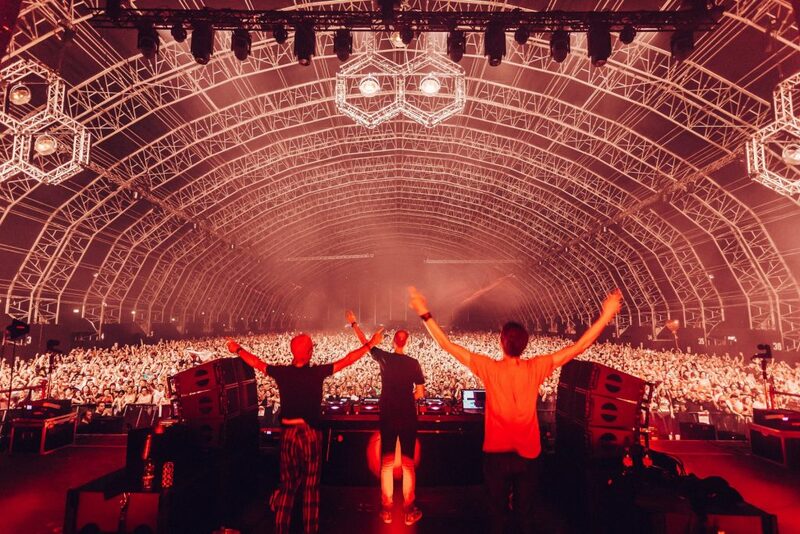 Trio thanked London’s crowd, we thanked them in our hearts with hands in the air, while every of last sounds was paralyzing – how many kilometers we will have to cross again for such crowd, lasers, venue, quality and extraordinary sensations?